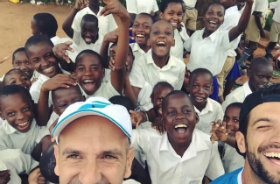 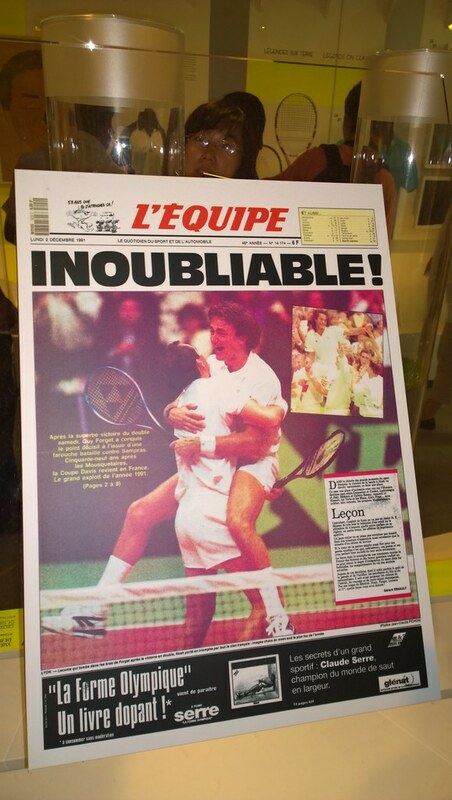 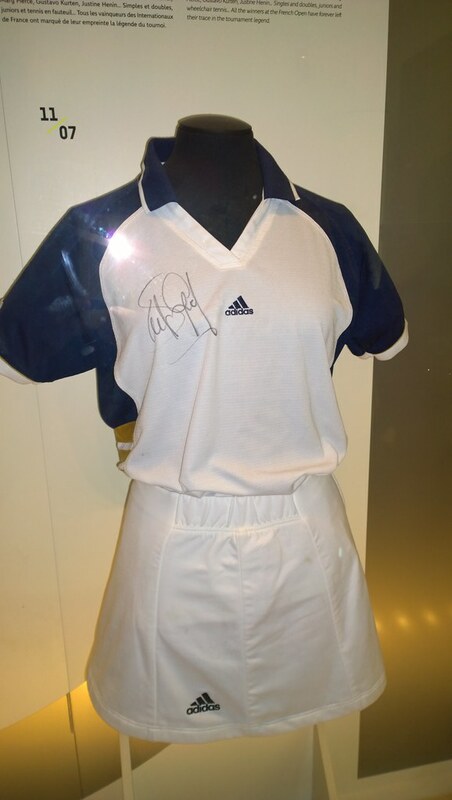 Also shown: Yannick Noah, Andre Agassi and Rafael Nadal racquets as well as Bjorn Borg, Steffi Graf and Roger Federer outfits. 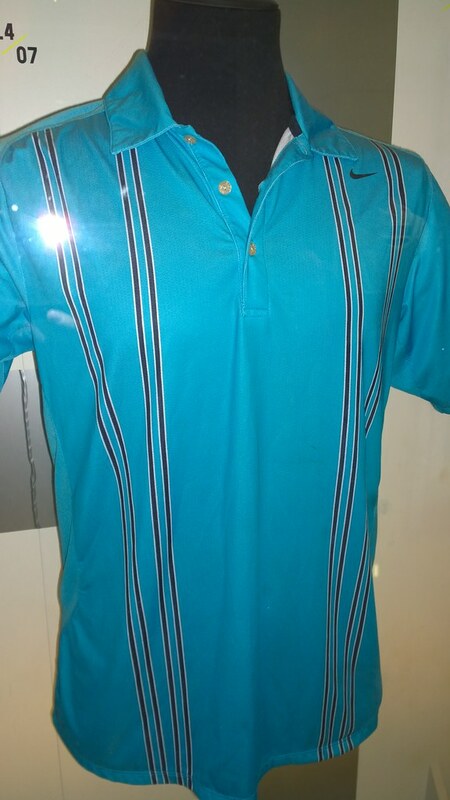 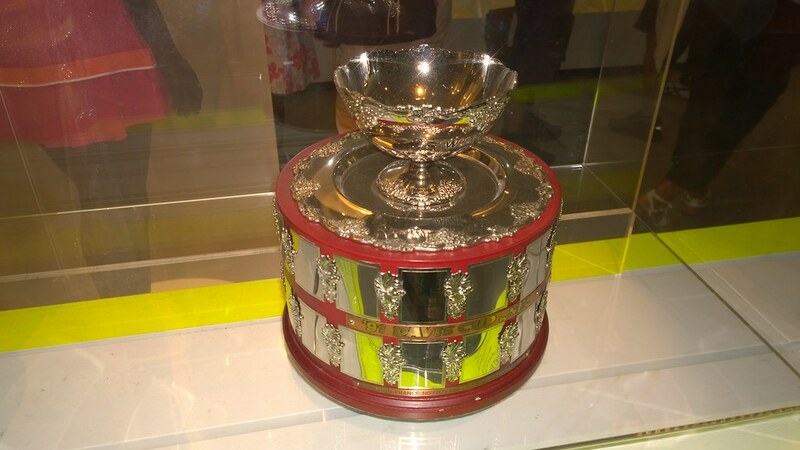 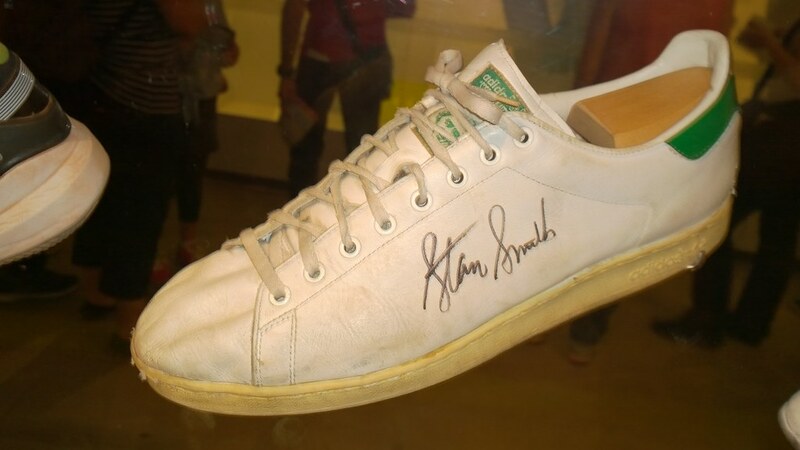 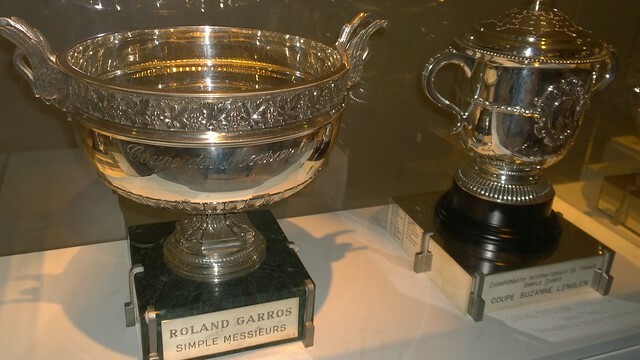 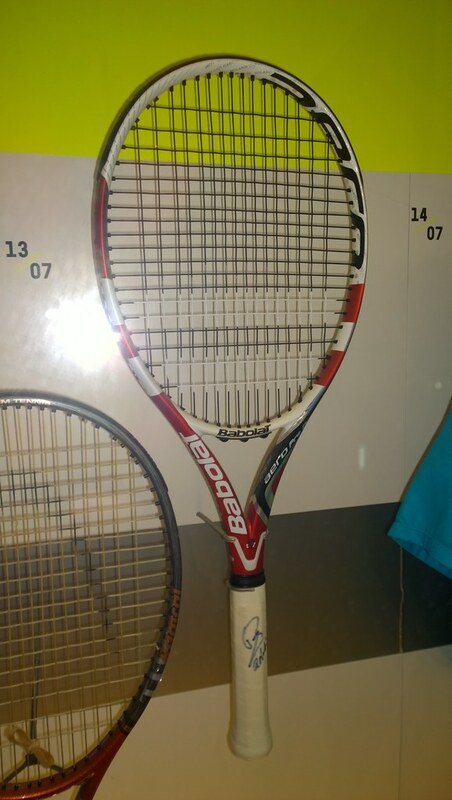 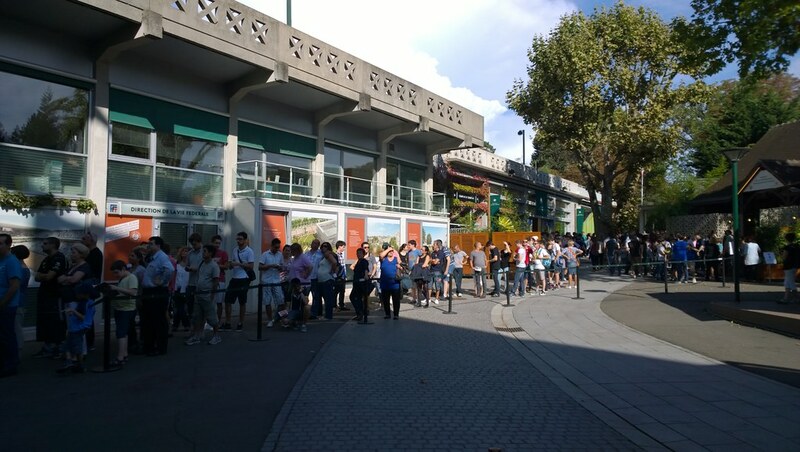 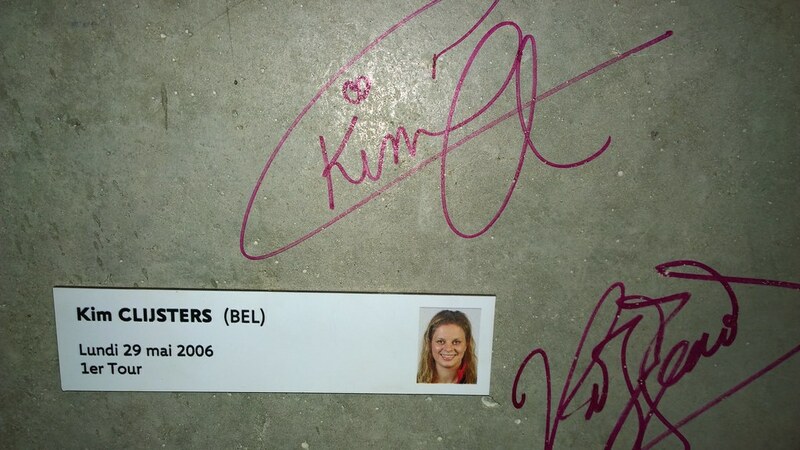 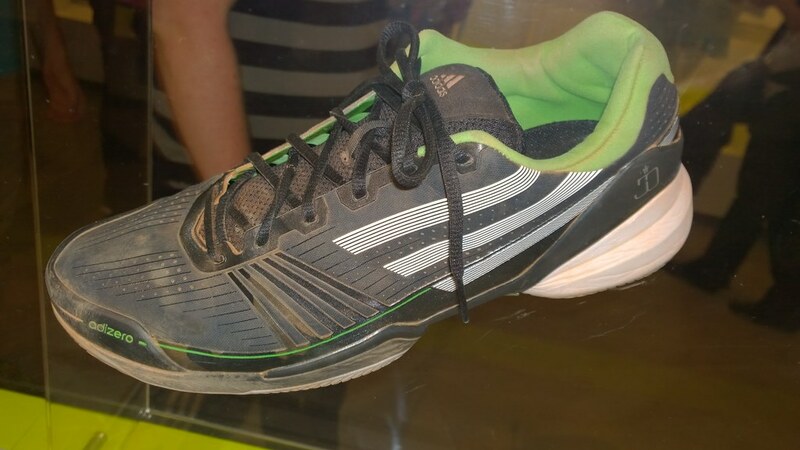 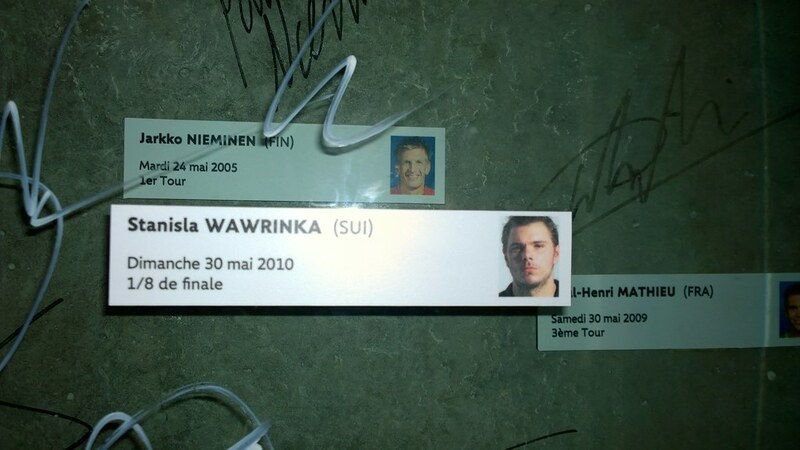 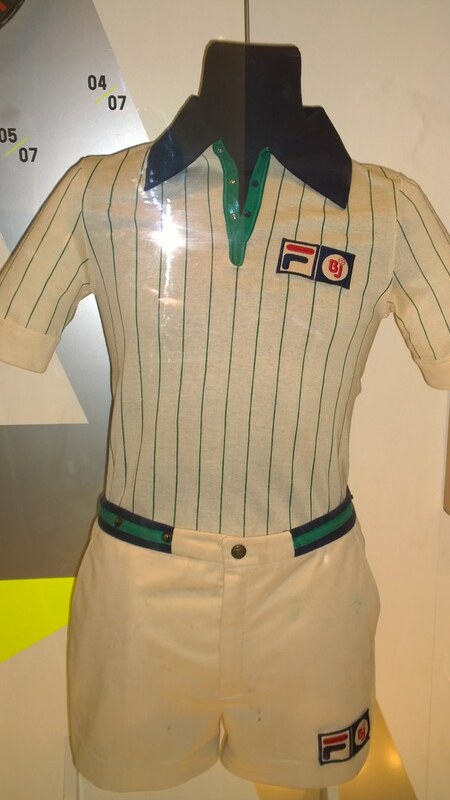 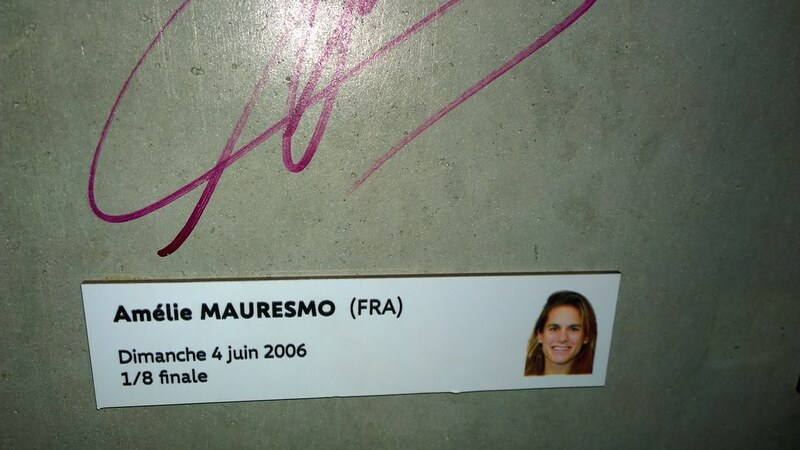 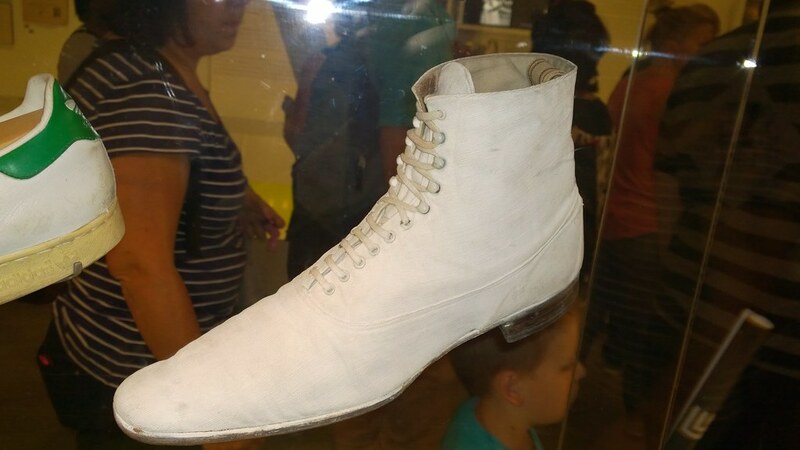 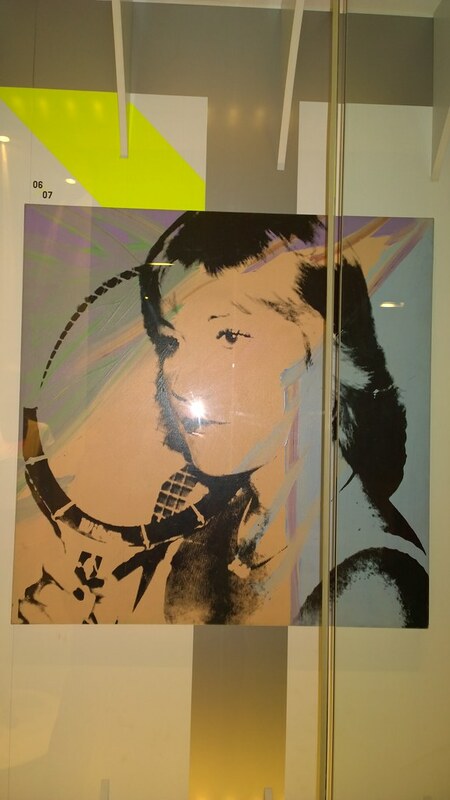 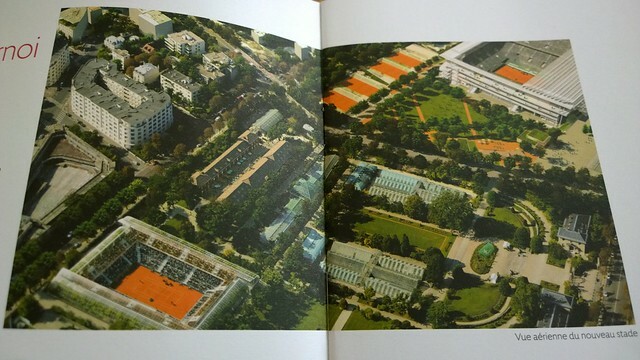 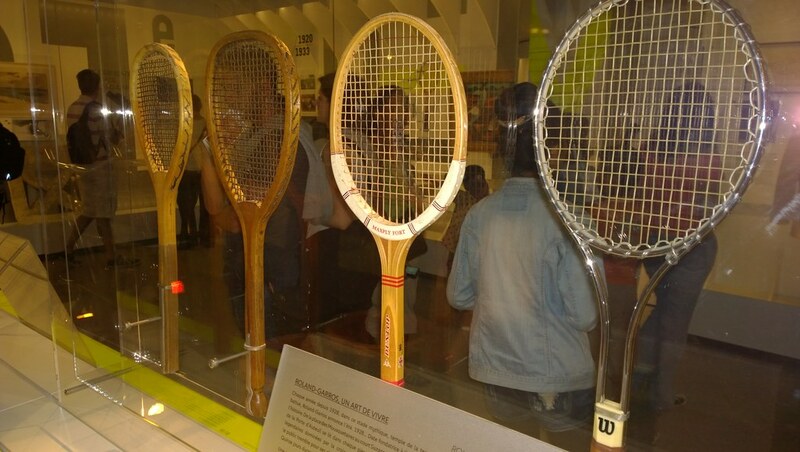 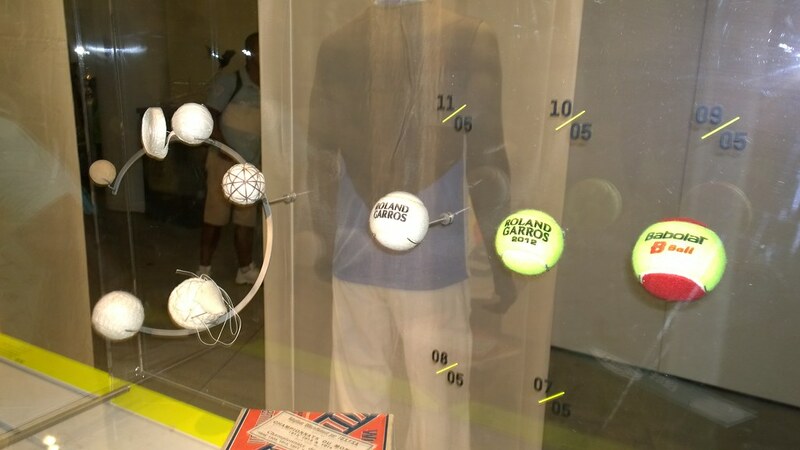 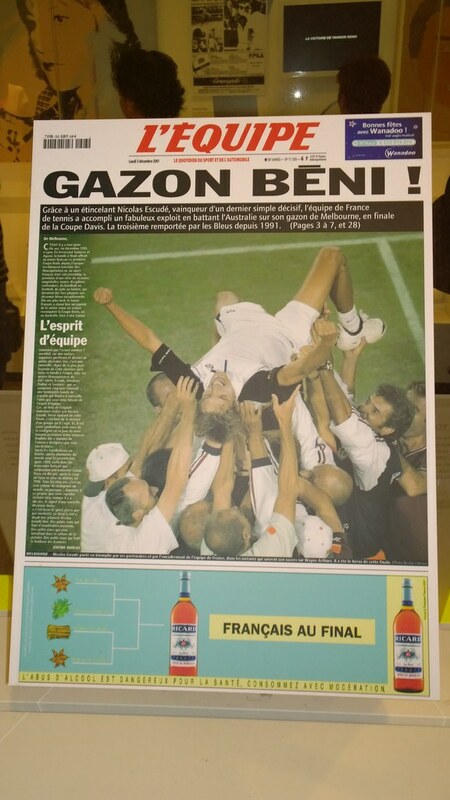 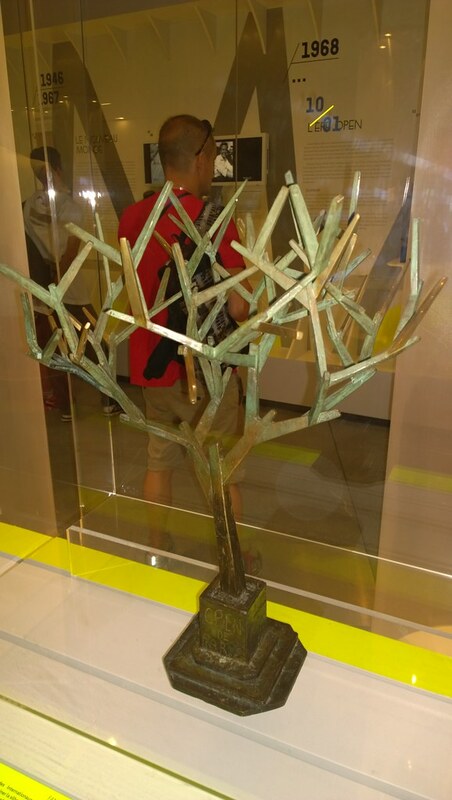 You can see more pictures at the end of this article and on my previous article: Tennis Museum at Roland Garros. 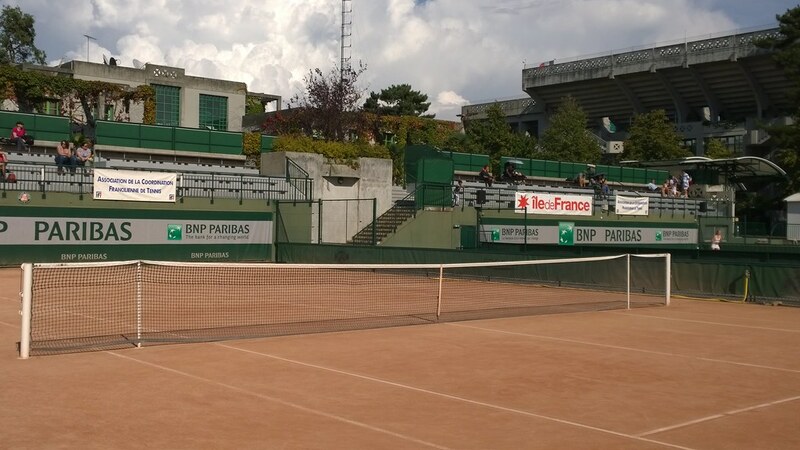 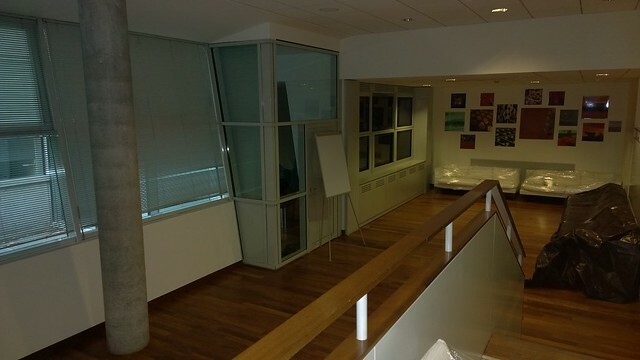 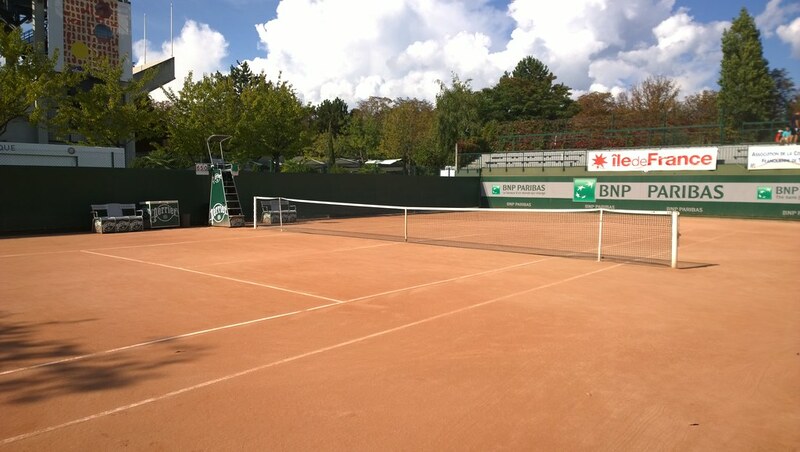 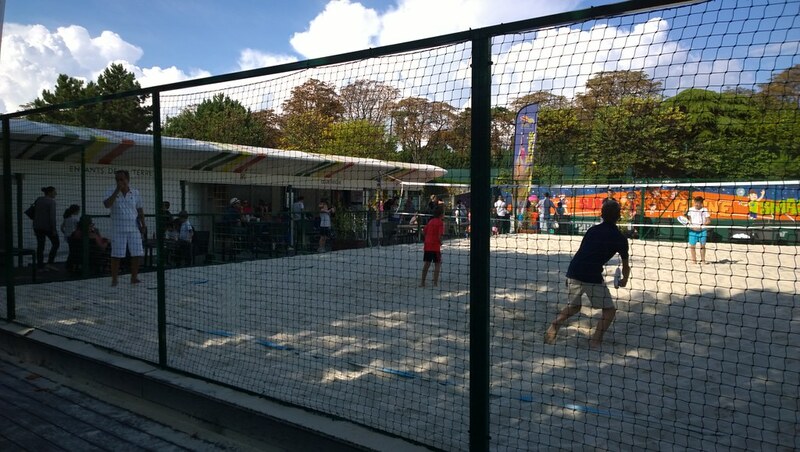 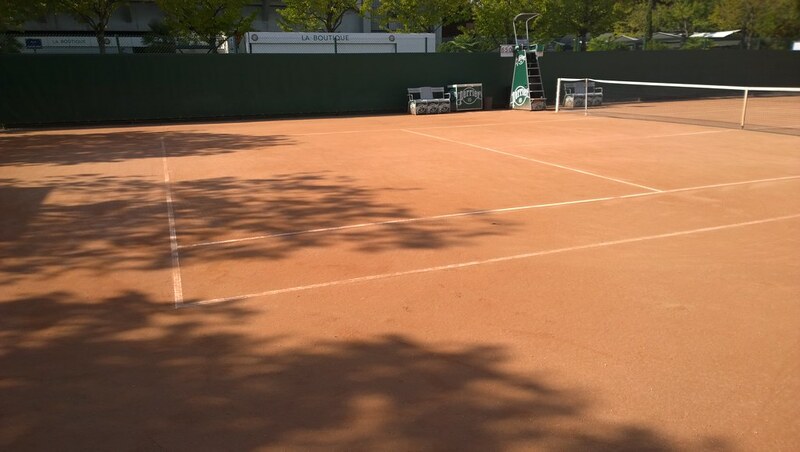 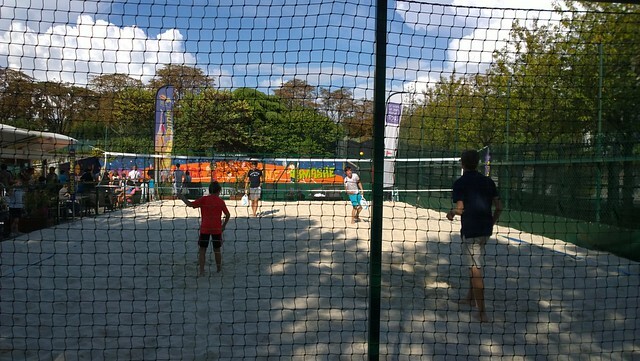 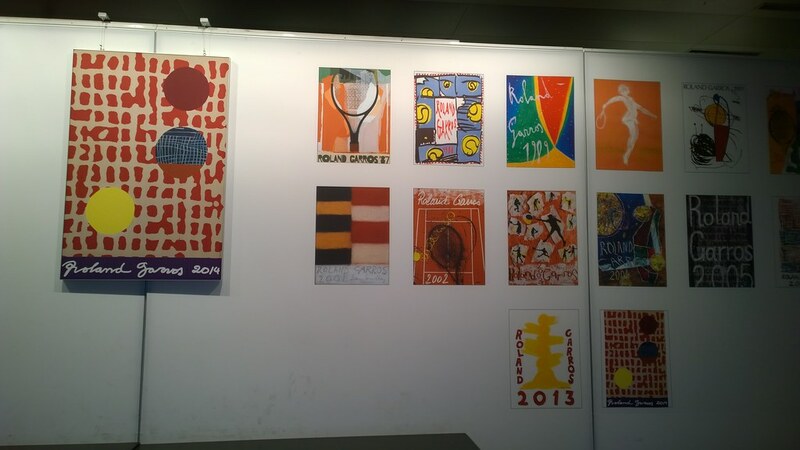 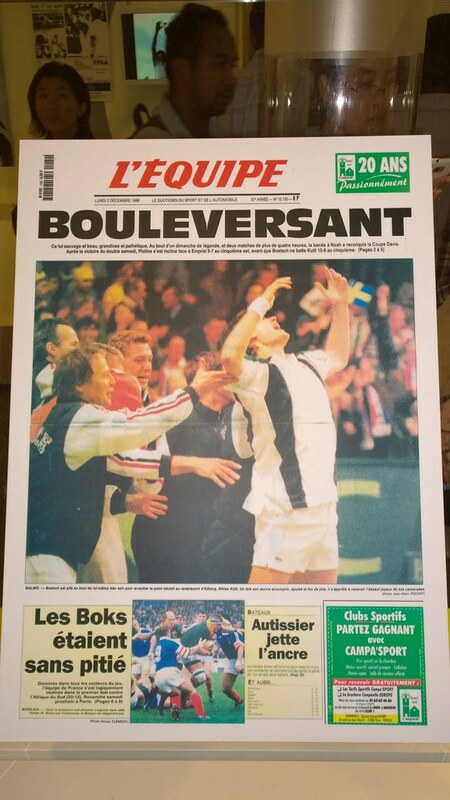 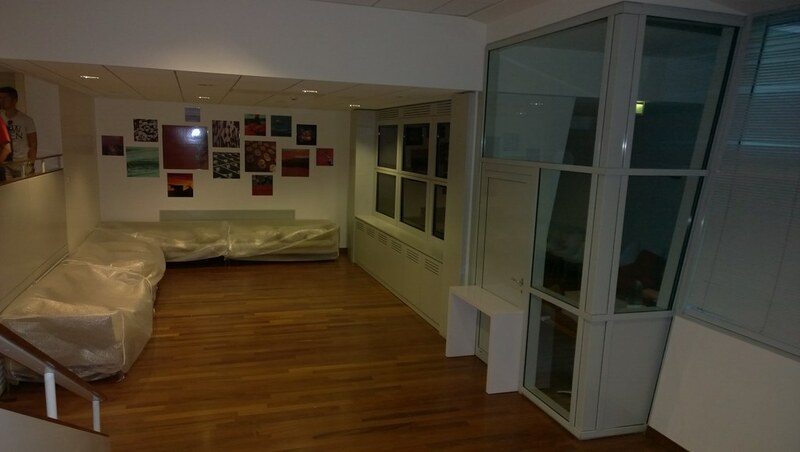 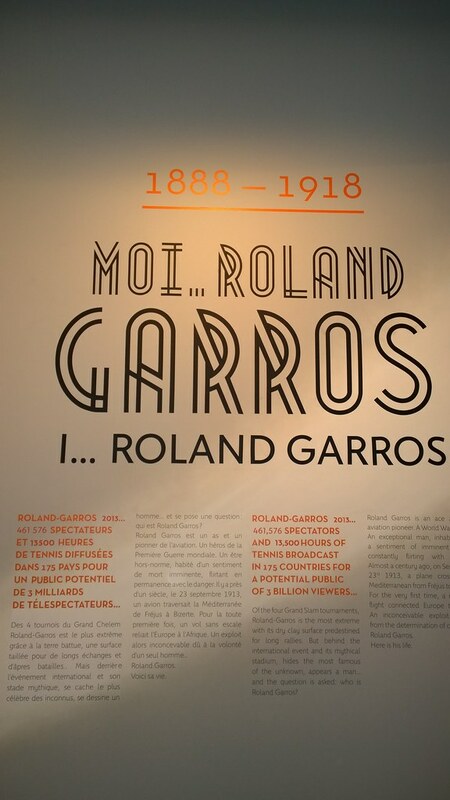 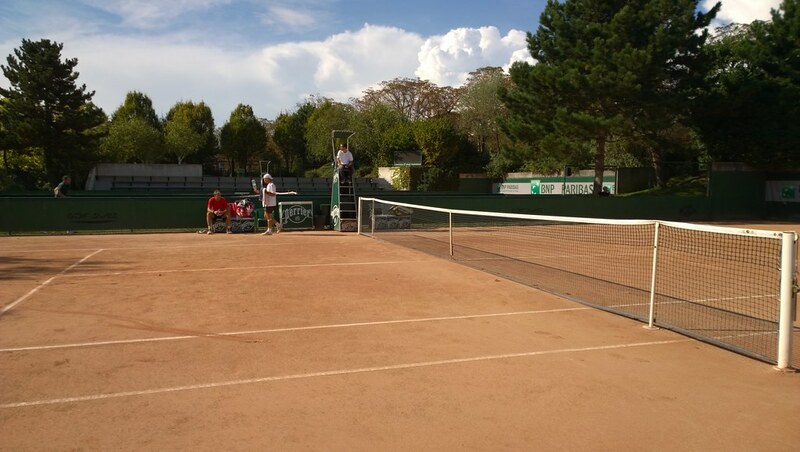 We also had access to two temporary exhibitions: Moi Roland Garros (I Roland Garros) and Lignes de front. 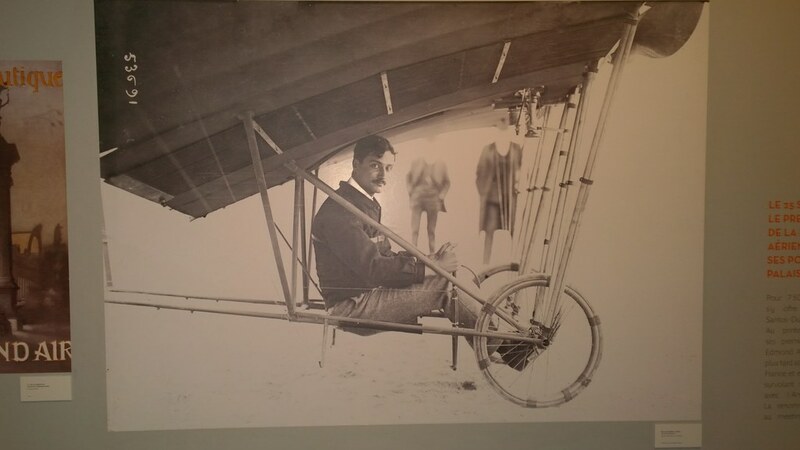 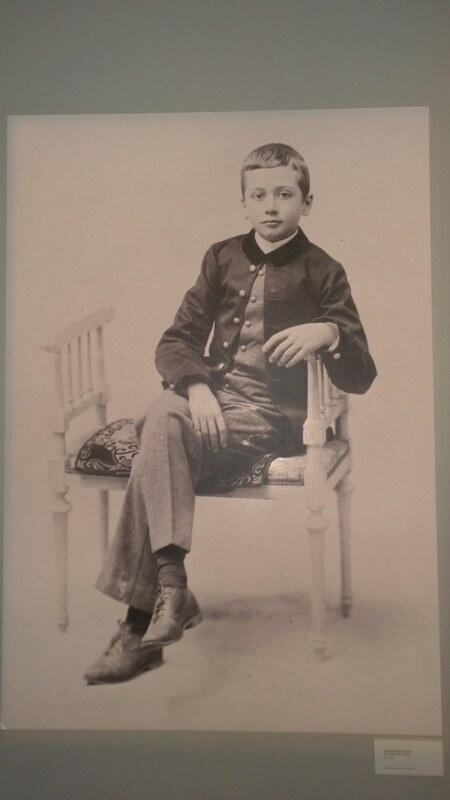 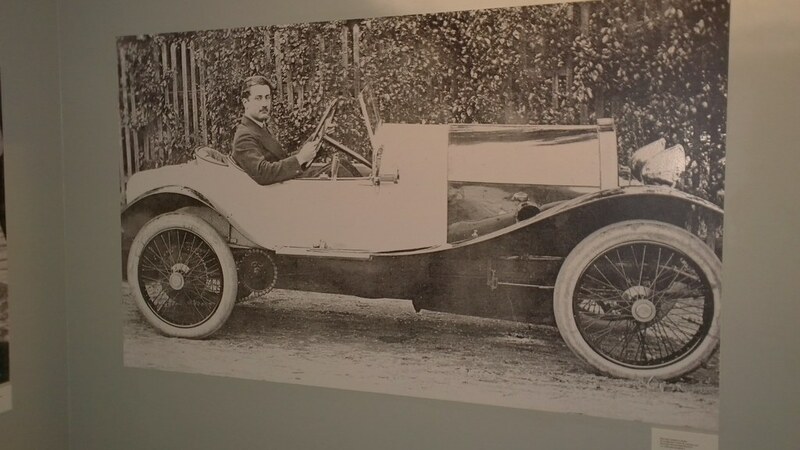 As you probably know, Roland Garros was not a tennis player, but a pioneer aviator who made the first solo flight across the Mediterranean Sea and whose favorite sport was rugby. 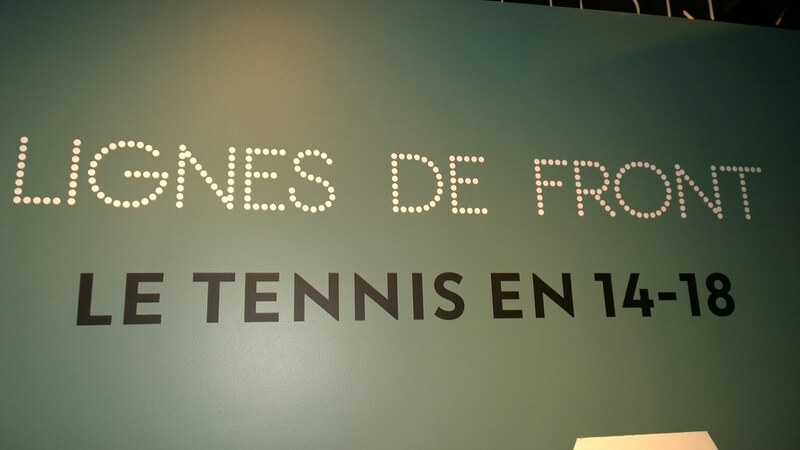 The exhibition give visitors insight into the life of this French national hero who perished in World War I.
Lignes de front (“Front lines: tennis in 1914-18”) presents the life of twelve great tennis players (among them Suzanne Lenglen, Bill Tilden and Jean Borotra) during the Great War . 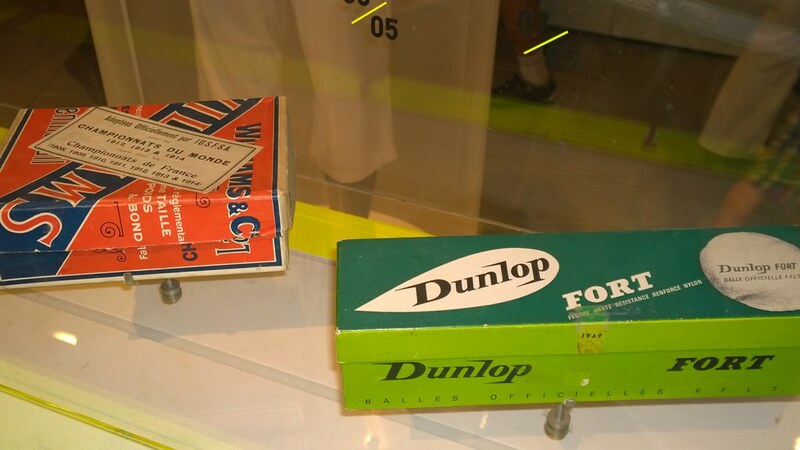 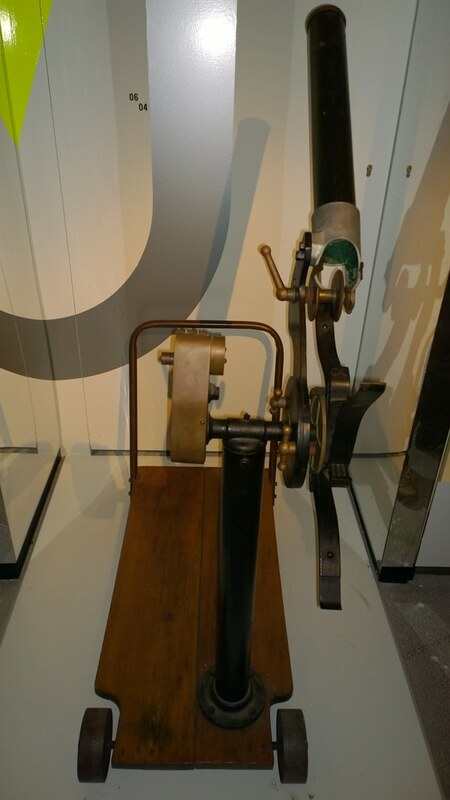 This exhibtion is part of the First World War centenary commemorations. Next stop: a look at the players only areas, the locker rooms and interview room. 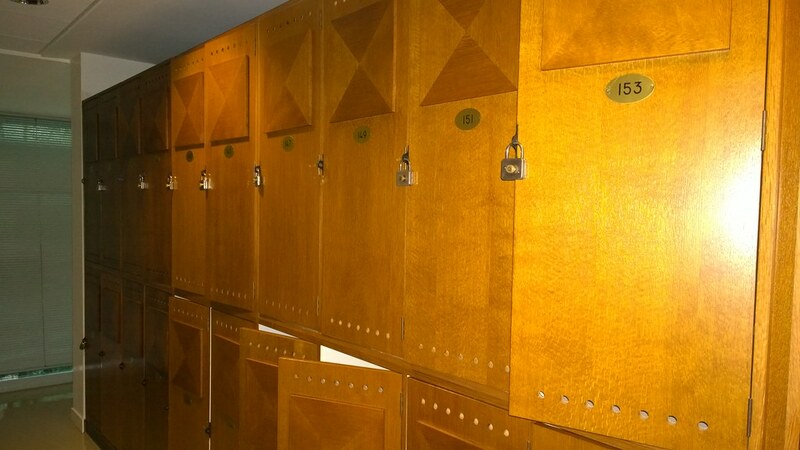 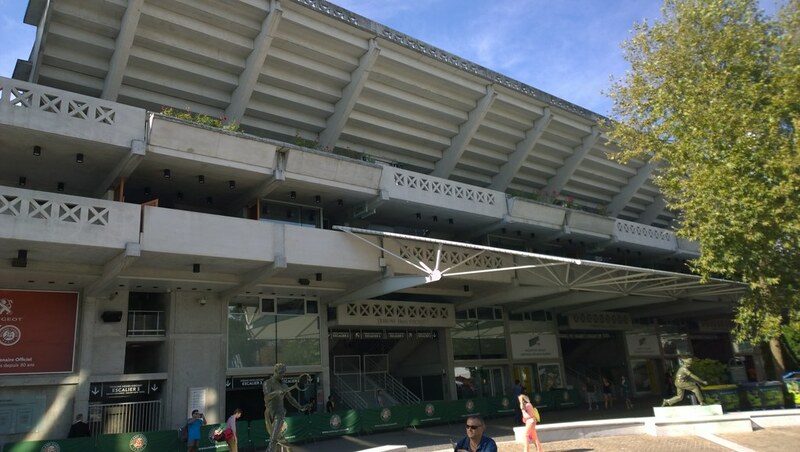 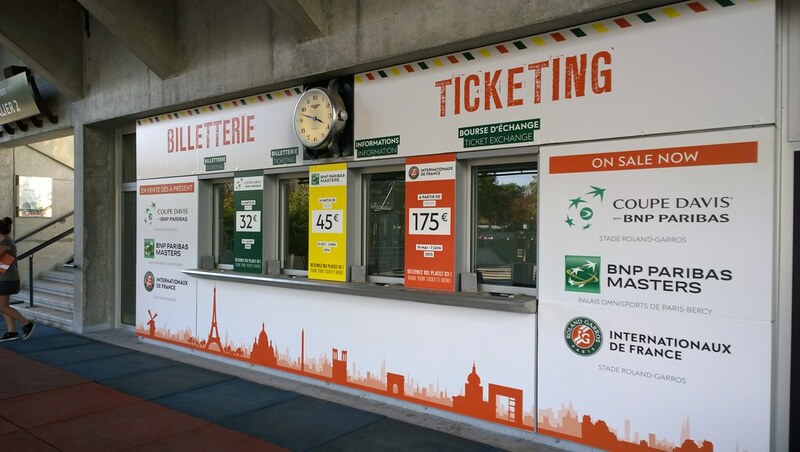 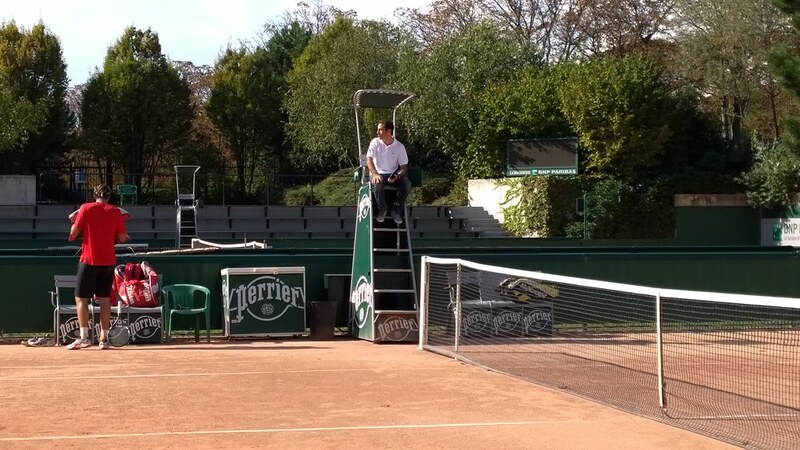 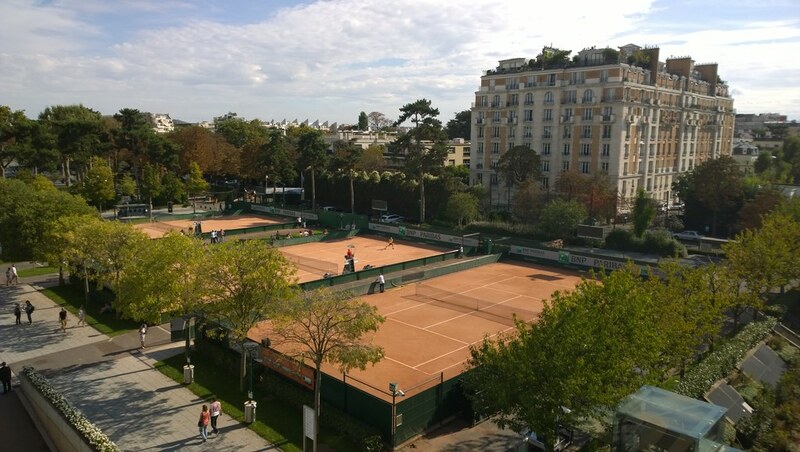 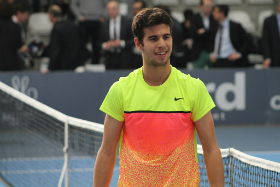 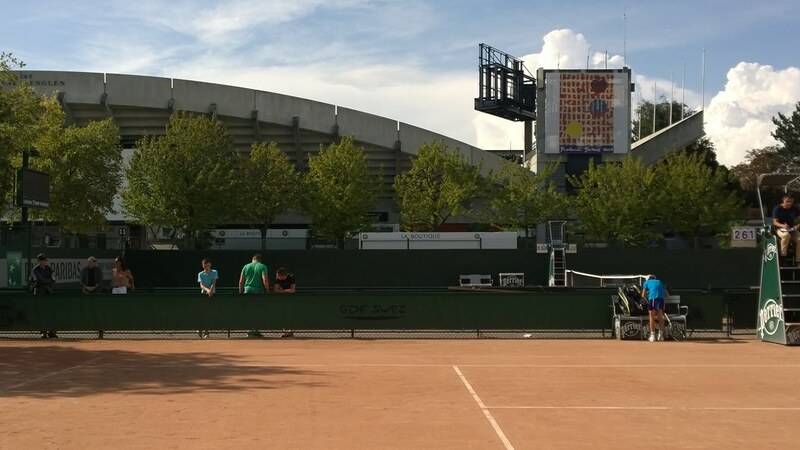 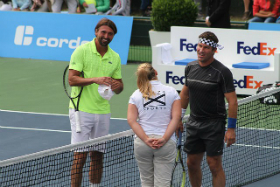 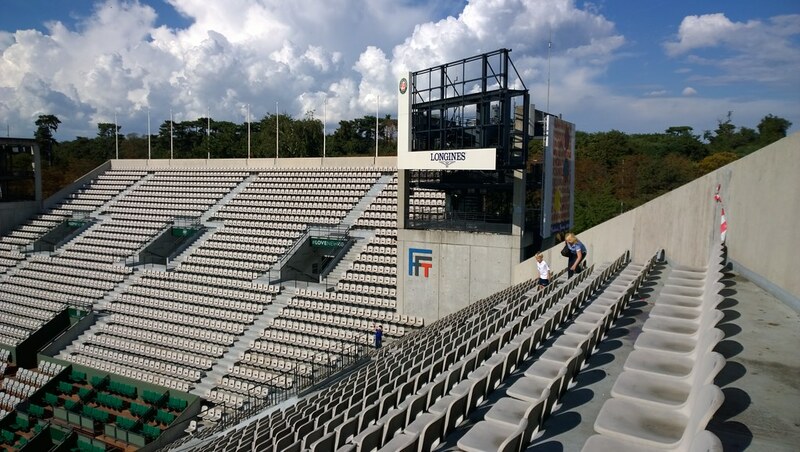 You can find more pictures in my previous article: Get behind the scenes at Roland Garros. 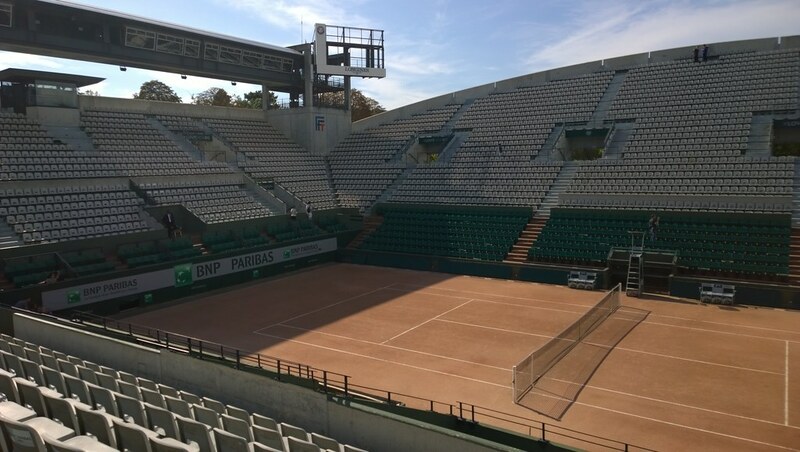 Court Philippe Chatrier was built in 1928 as Roland Garros’s centerpiece and remains its principal venue, seating 14,840 spectators. 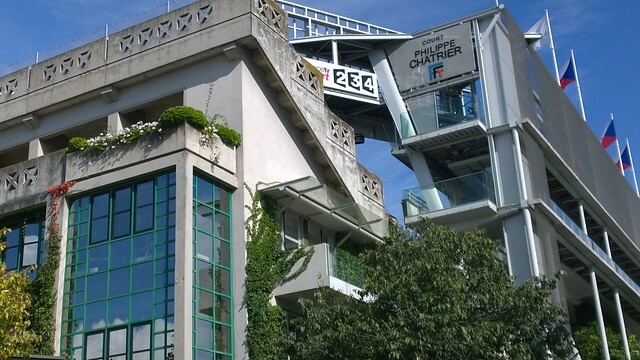 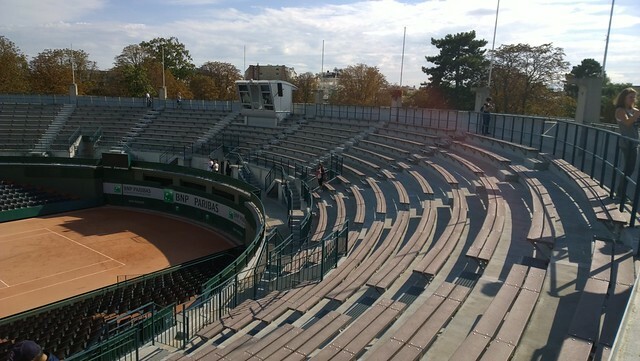 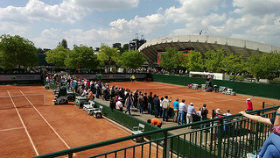 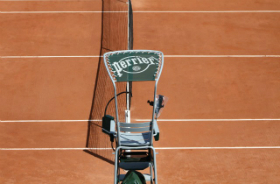 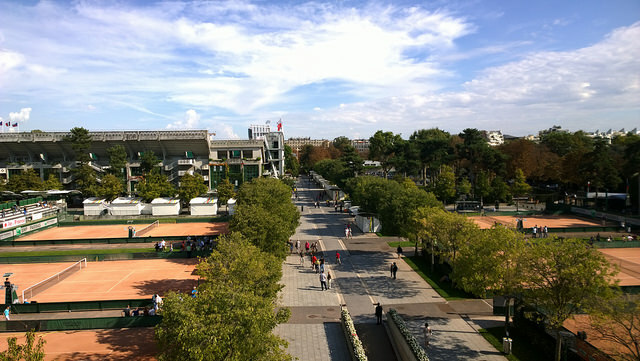 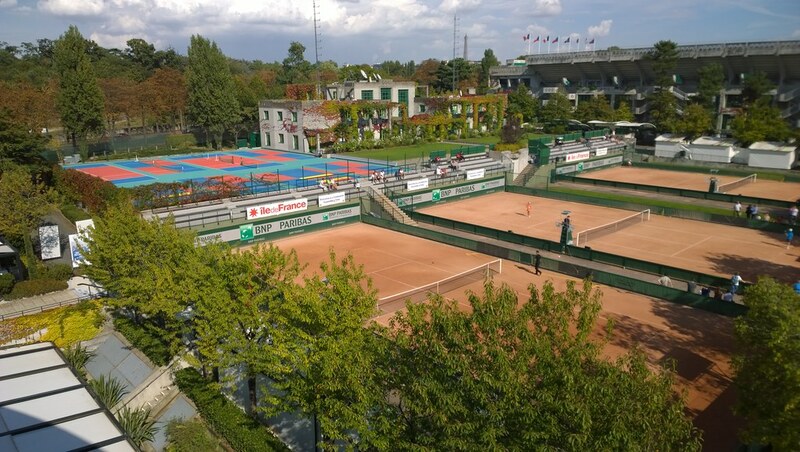 The four main spectator grandstands are named for les Quatre Mousquetaires (“Four Musketeers”) – Jacques “Toto” Brugnon, Jean Borotra (the “Bouncing Basque”), Henri Cochet (the “Magician”), and René Lacoste (the “Crocodile”) – who dominated men’s tennis in the 1920s and ’30s. 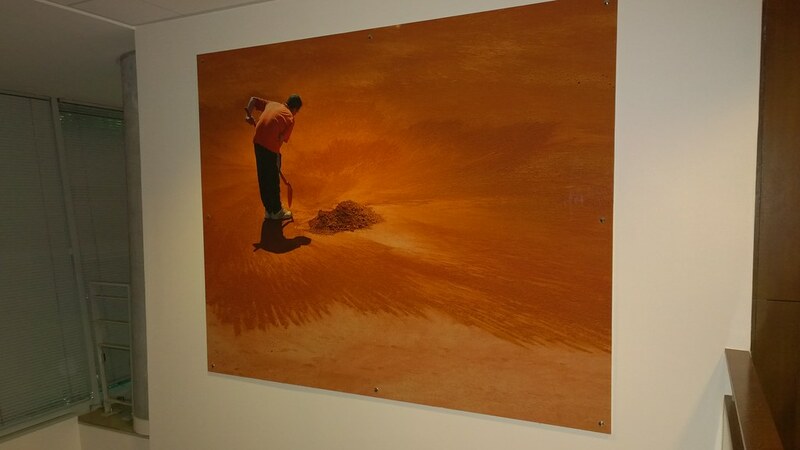 It was just like at Ikea, you had to follow the path. 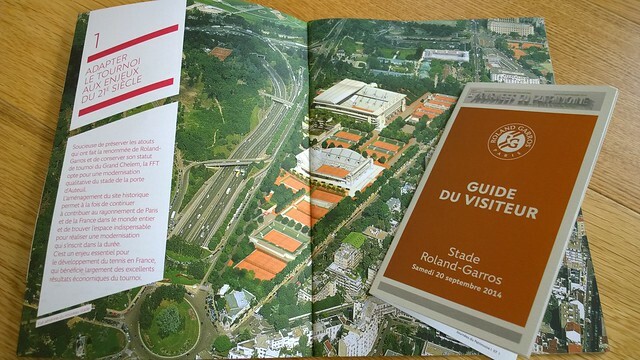 So, we headed to the Maison du projet, showcasing the new Roland Garros set to be inaugurated in 2018. 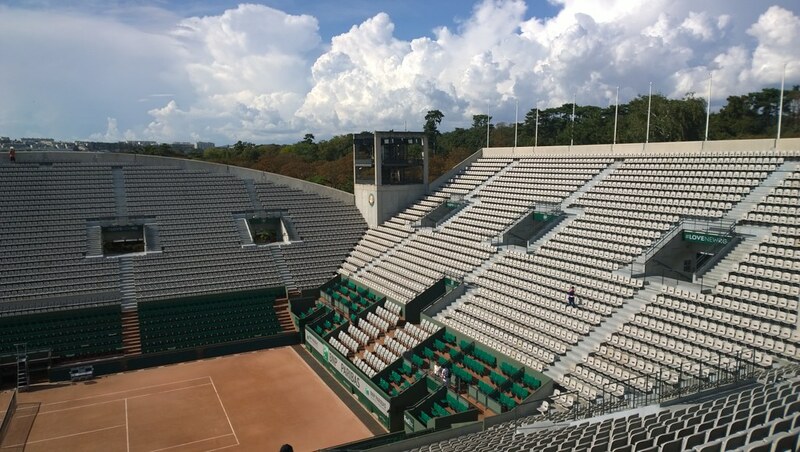 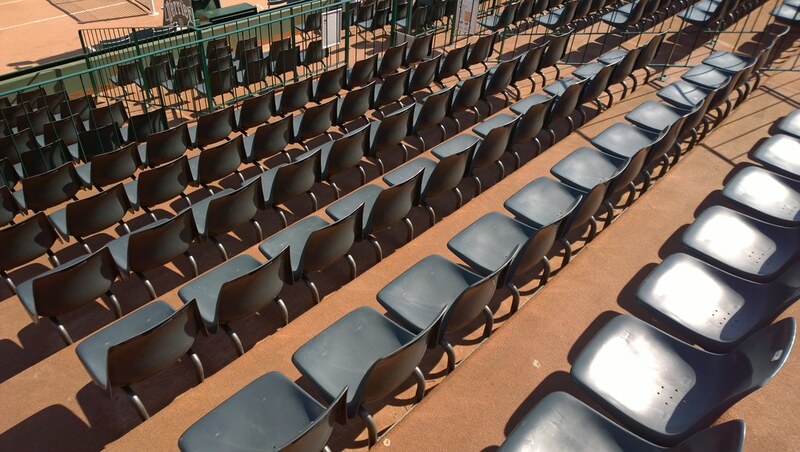 The Court Philippe Chatrier will be fitted with a retractable roof and will also be altered to provide more comfort for spectators (that won’t be very difficult…) and to create extra space for journalists and players. 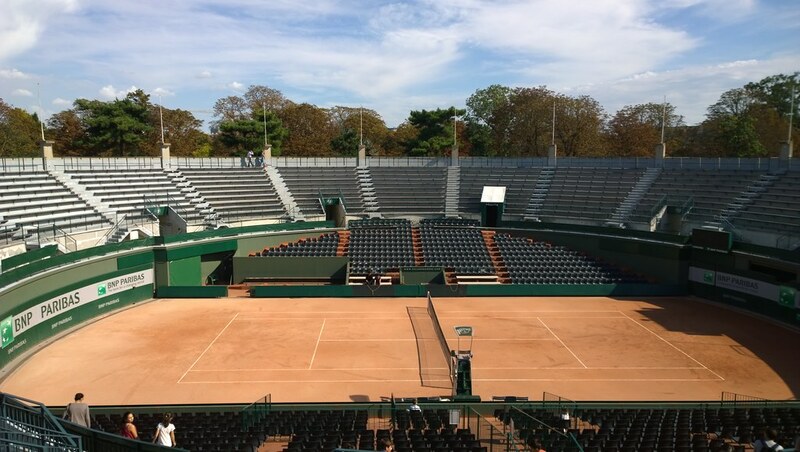 A semi-sunken new court with 4,950 seats will be constructed, surrounded by four large greenhouses, with a botanical garden. 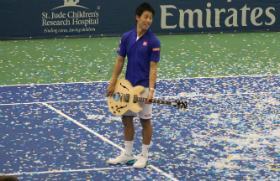 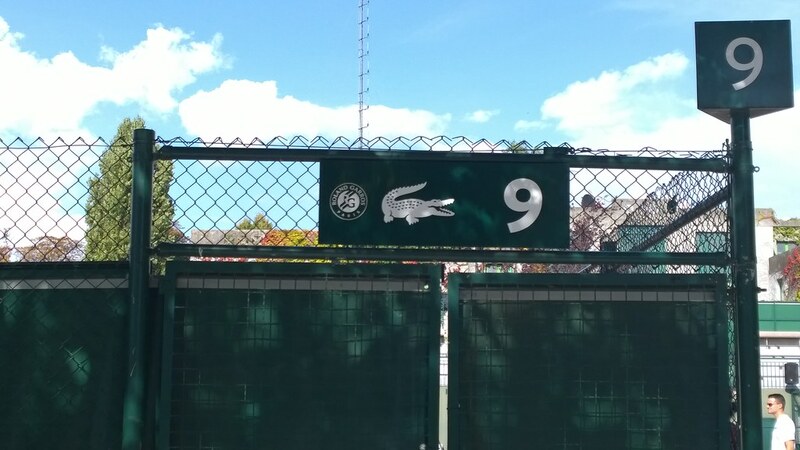 It will replace the current No.1 Court that will be destroyed. 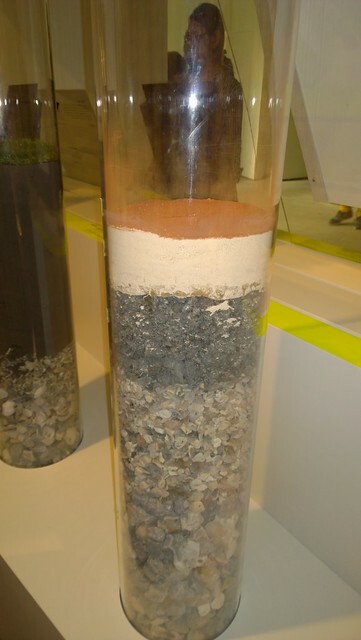 The project has estimated costs of 340 million euros. 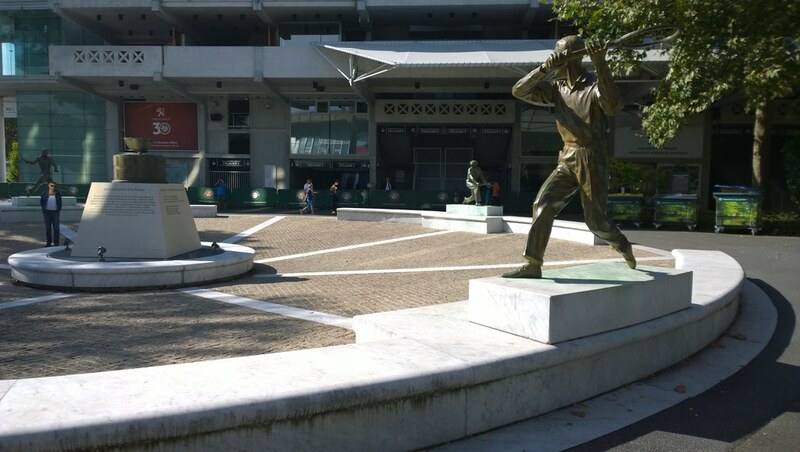 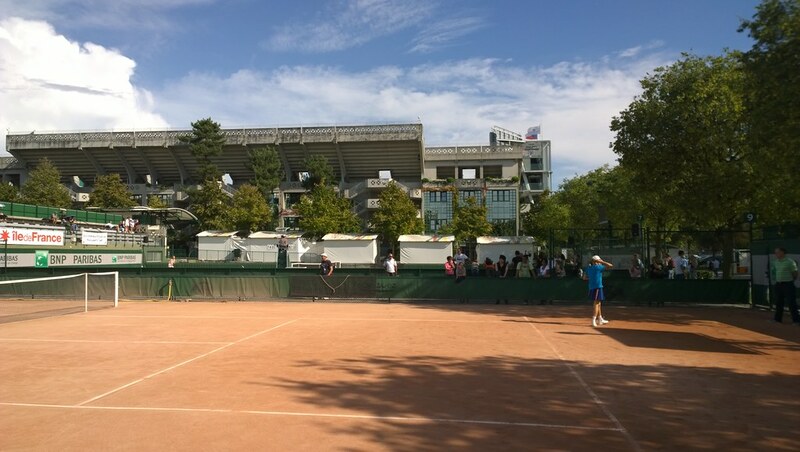 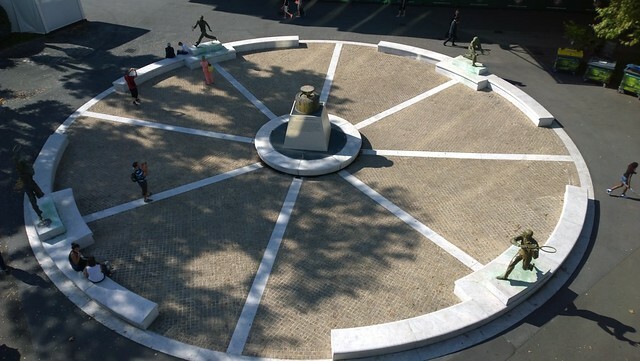 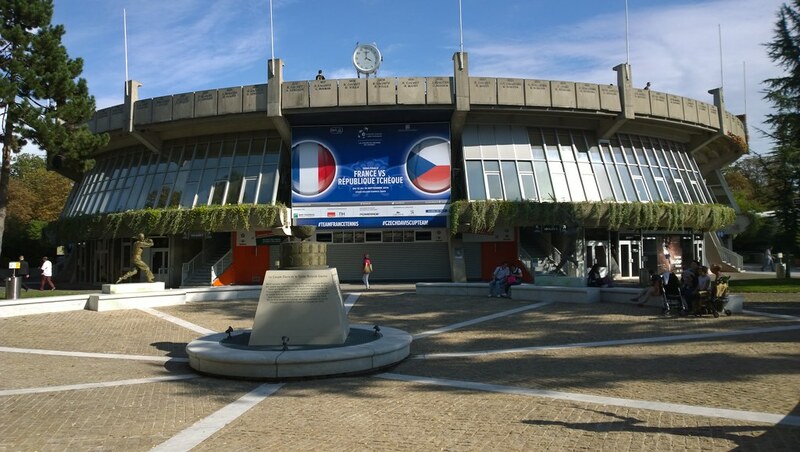 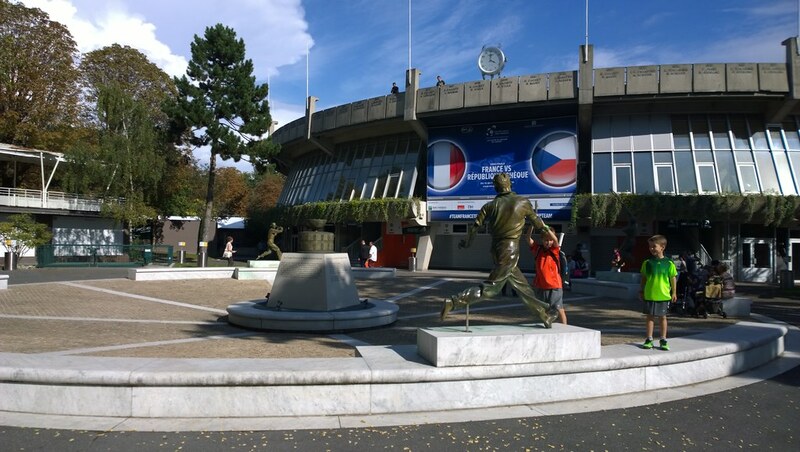 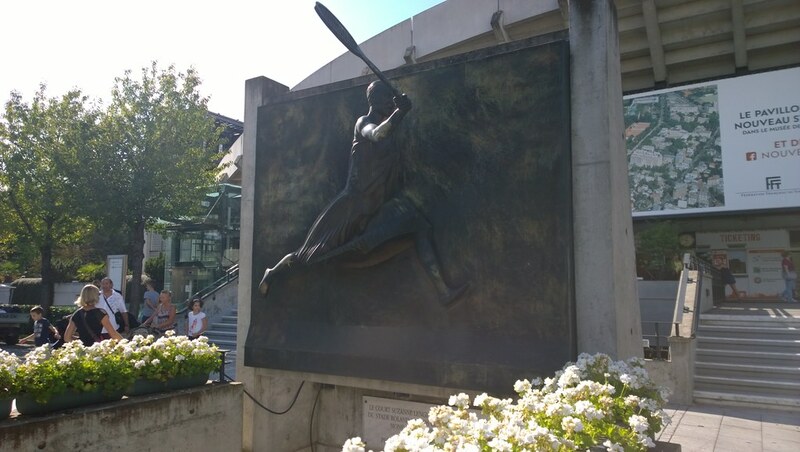 Located between Court Philippe Chatrier and Court number one, the square is surrounded by statues of the 4 Musketeers of French Tennis, at the centre of the square, a Davis Cup replica. 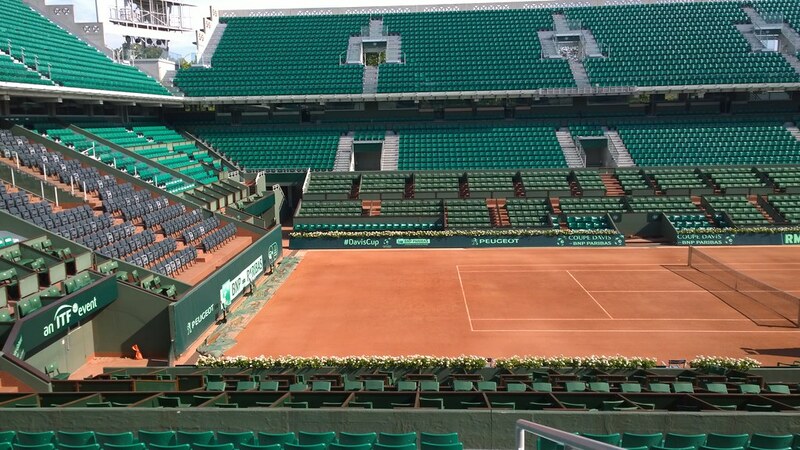 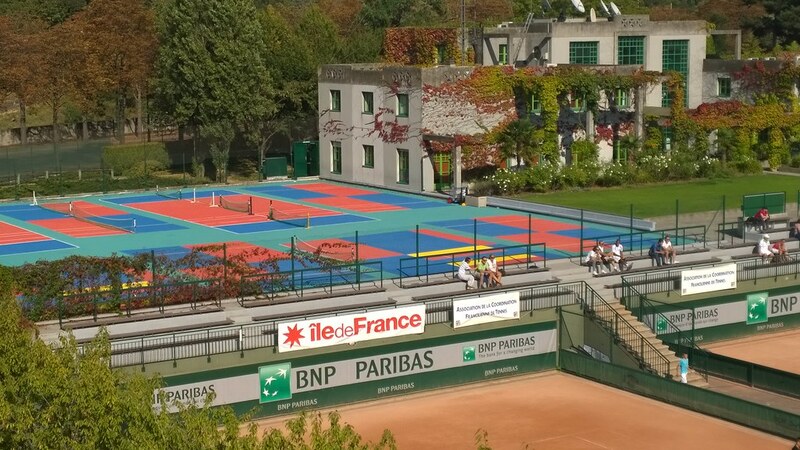 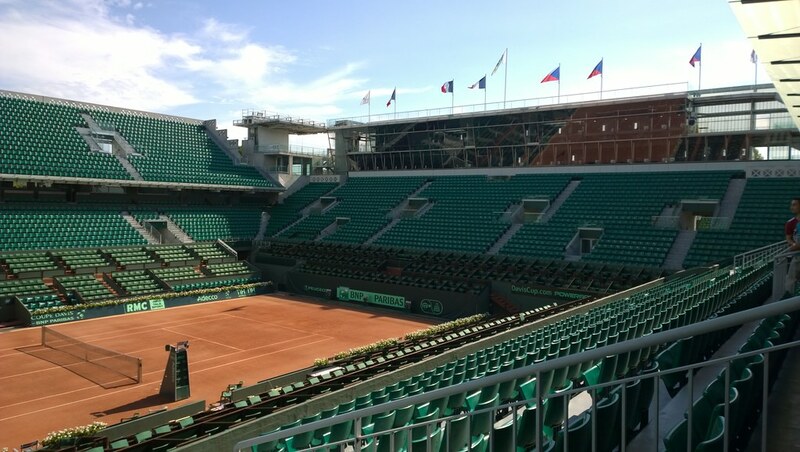 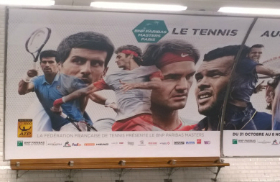 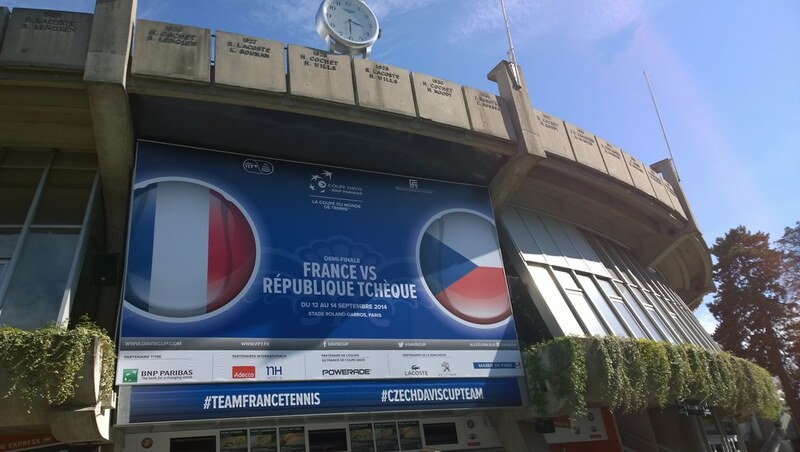 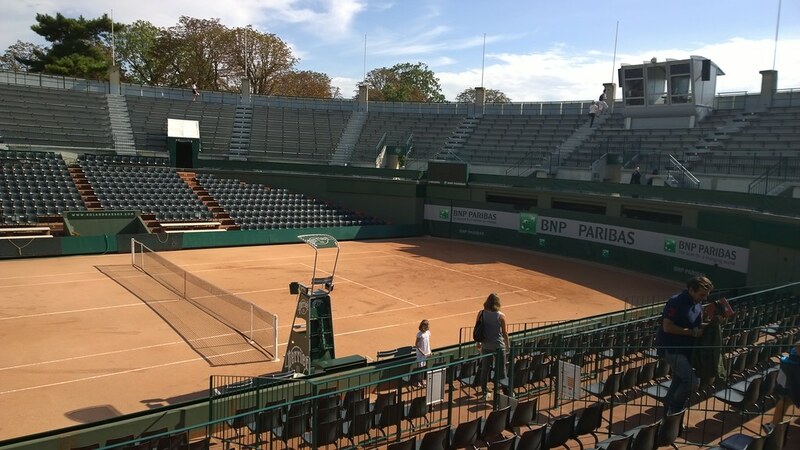 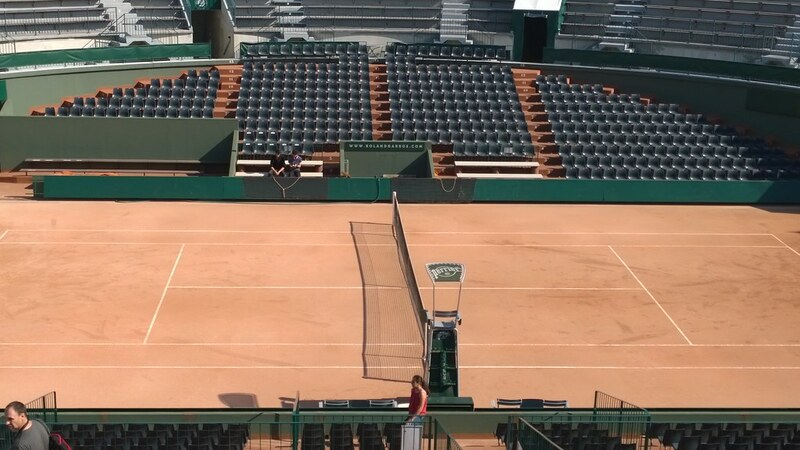 There’s a strong link between the Davis Cup competition and the Roland Garros stadium. 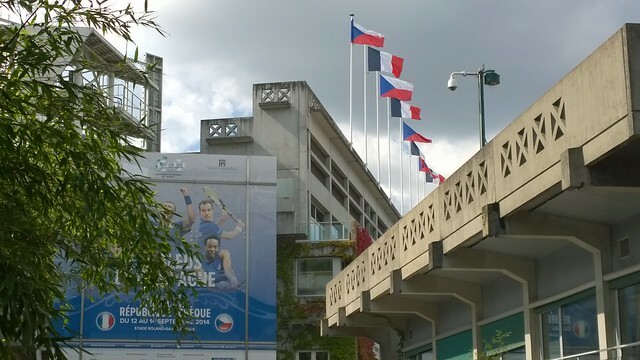 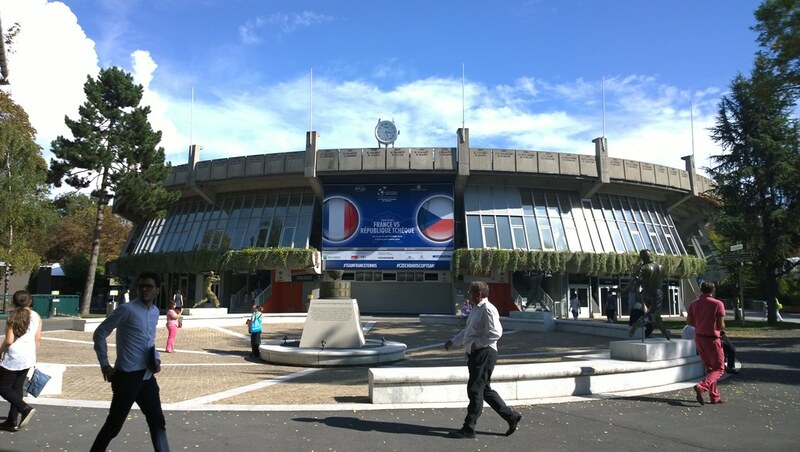 After the Mousquetaires won the Davis Cup on American soil in 1927, the French Federation of Tennis decided to defend the Cup in 1928 at a new tennis stadium at Porte d’Auteuil. 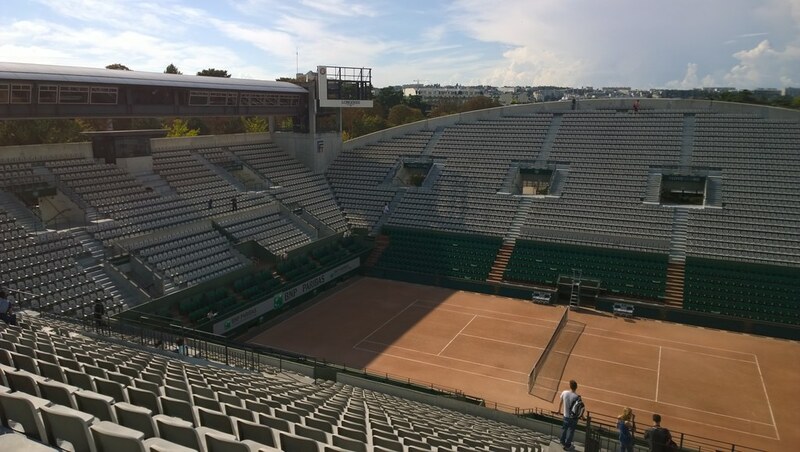 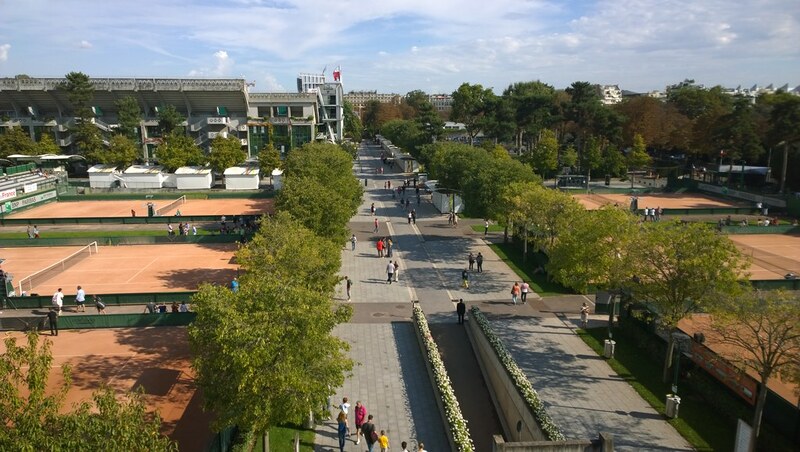 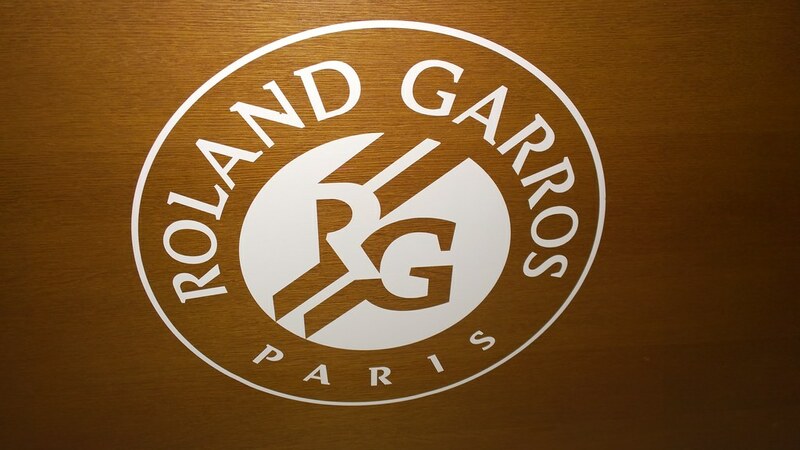 The Stade de France had offered the tennis authorities three hectares of land with the condition that the new stadium must be named after the World War I pilot, Roland Garros. 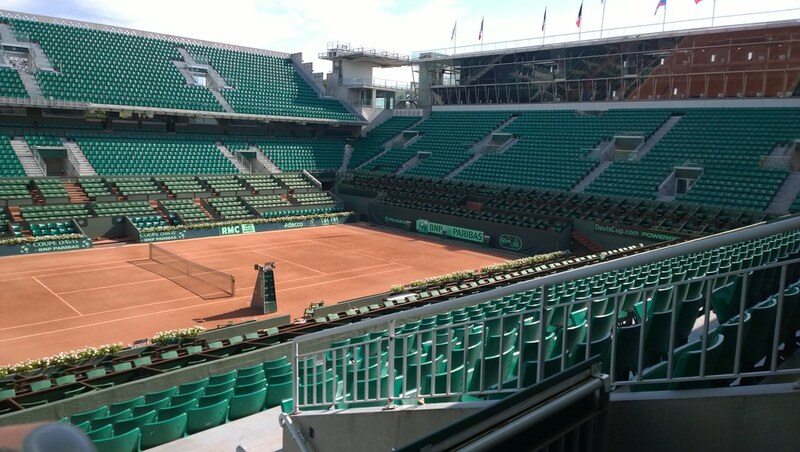 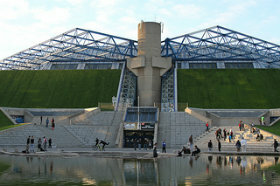 The new Stade de Roland Garros hosted that Davis Cup challenge. 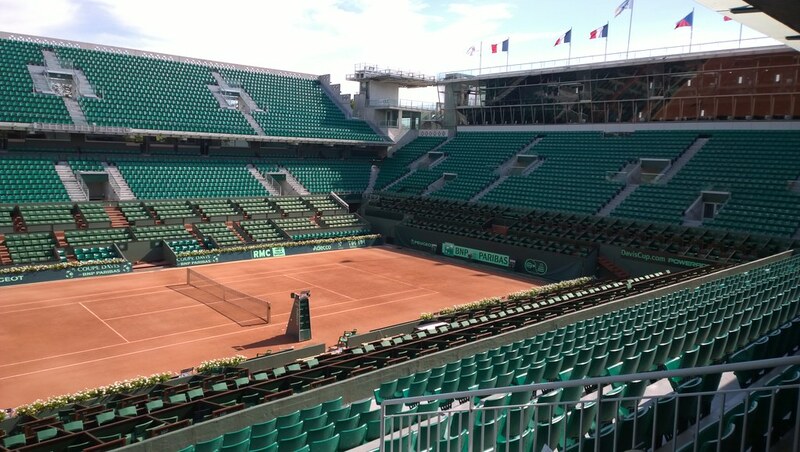 The beautiful Court 1 – nicknamed the “Bullring” because of its circular shape – is a favorite among serious tennis fans because of its relatively small size and feeling of close proximity to the action. 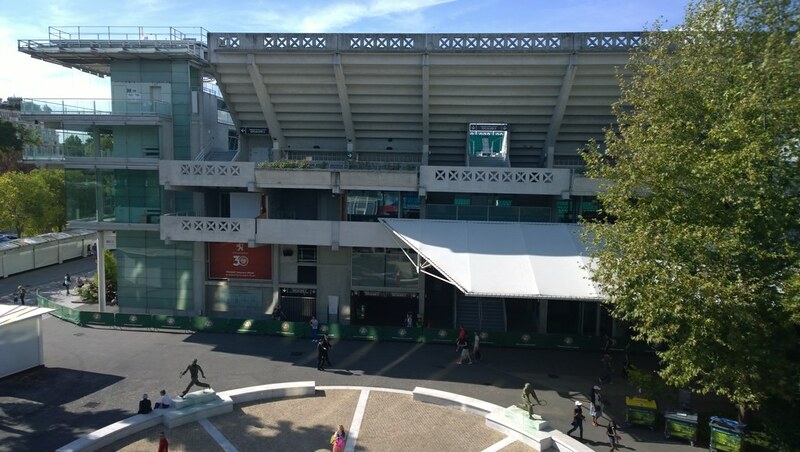 The Court number 1 has been the scene of some stunning French Open upsets, such as unseeded Gustavo Kuerten‘s 3rd-round victory over Thomas Muster in 1997, on his way to his first of three Roland Garros titles; and Gabriela Sabatini‘s defeat – after a 6-1, 5-1 lead and five match points – to Mary Joe Fernandez in the 1993 quarterfinals. 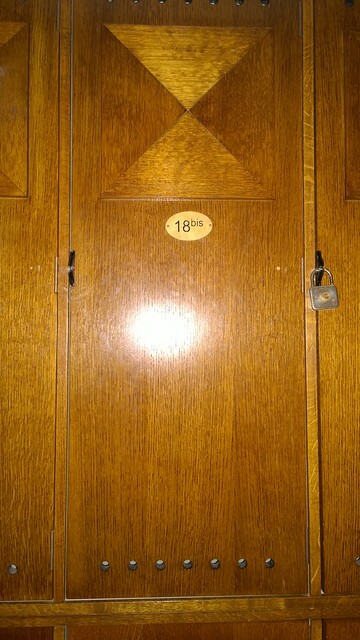 It was also the site of Marat Safin’s famous “dropped pants” match against Felix Mantilla in 2004. 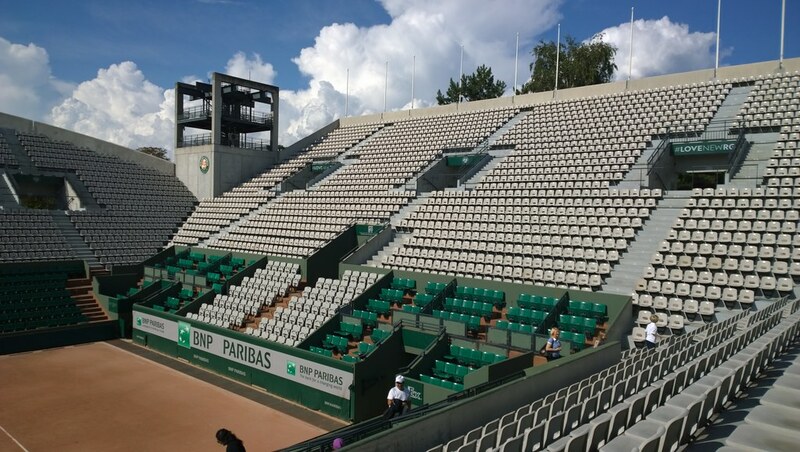 Much cosier than Court Philippe Chatrier, the secondary Roland Garros stadium with a capacity of 10,068 spectators was built in 1994. 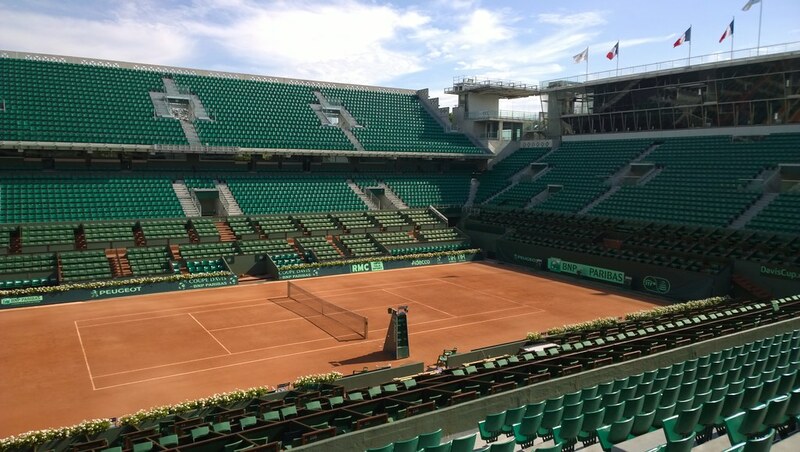 Suzanne Lenglen, born in 1899, was the first female tennis celebrity and one of the first international female sport stars, named La Divine (the divine one) by the French press. 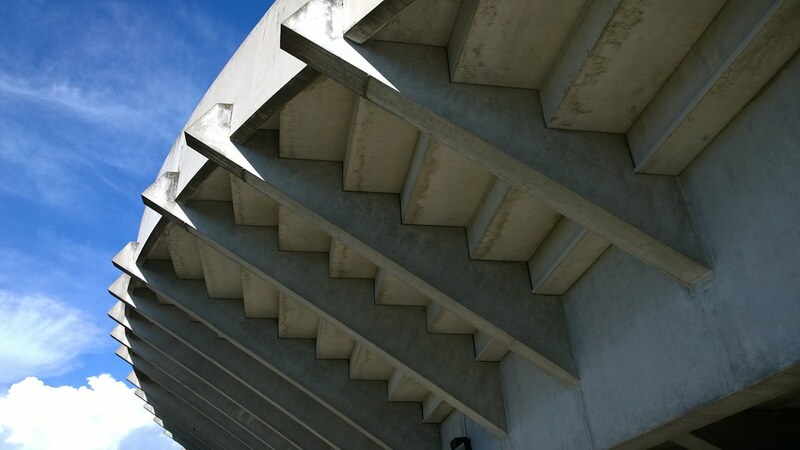 If you’re interested in visiting the stadium, check out the official website to find all the informations.